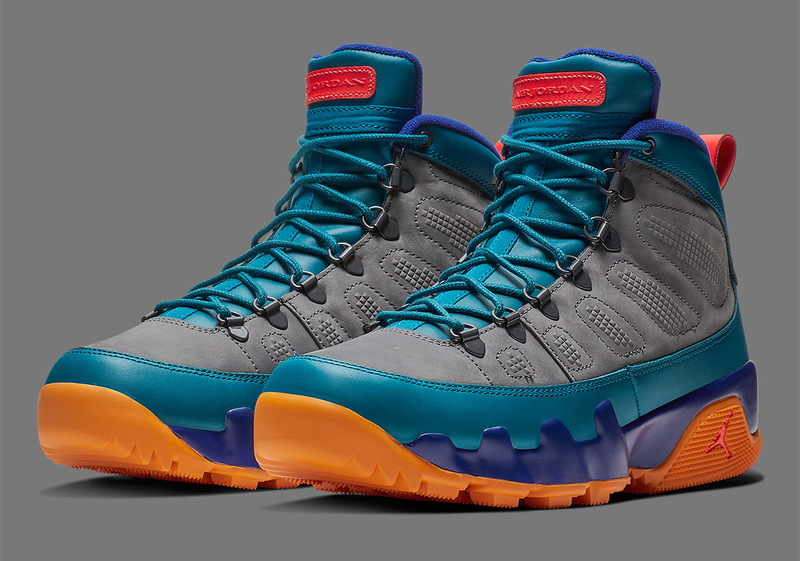 Throughout the early life of the Air Jordan 9 NRG Boot, the Jumpman has kept its color schemes rather simple, opting for autumn and winter-friendly iterations done up in greens, olives, and browns. Now, the Jordan Brand is ready to let loose, with a selection dressed in an array of hues, with blue, purple, orange, grey, and golden yellow. Much likes its predecessors, this AJ9 Boot’s outsole equips a rugged traction pattern that increases the durability of this utilitarian creation. D-ring lacelets and work boot-style laces add to that aforementioned aesthetic while its unique color scheme allows for consumers who opt to make statements with their footwear not to miss a step in the harsh weather. No official release date has been confirmed at the moment, but grab an official look below and expect pairs to hit shelves in the coming weeks.